Make sure to consult your physician before beginning any fitness program. This includes a complete physical and foot exam and especially important for those who are overweight, smoke, or haven’t pursued any physical activity in a long time. The American Podiatric Medical Association (APMA) stresses the importance of foot care in exercising. 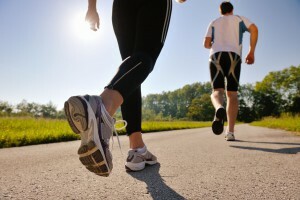 People don’t realize the tremendous pressure that is put on their feet while exercising. For example, a 150-pound jogger puts more than 150 tons of impact on his or her feet when running three miles. The APMA also reports that improper foot care during exercise is a contributing factor to some of the more than 300 foot ailments.